Our Ethernet to fiber media converter is a rugged, full-featured DIN rail mount converter in a small form factor IP31 housing. 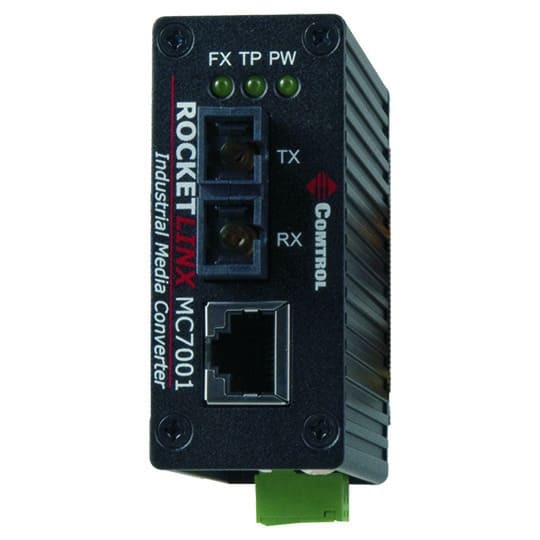 The RocketLinx MC7001 is an Ethernet to fiber media converter designed to excel in harsh industrial environments requiring a rugged, full-featured DIN rail mount converter in a small form factor IP31 housing. The RocketLinx MC7001 converts 10/100BASE-TX Ethernet to 100BASE-FX fiber with models available supporting Single-Mode fiber connections. Simple DIP switch configuration, low latency performance, a wide operating temperature range of -10° to 70°C, and advanced features including pure converter and switch modes combine to make the RocketLinx MC7001 a superior choice for applications requiring Ethernet to fiber conversion. Dimensions	4.0" x 1.2" x 2.8"
Switch Transfer Mode	Forwards Ethernet packets after received completely and after frame-checking. 64 to 1522 bytes supported.